Owned and bred by Mr J & JS Douglas Mains of Airies, Scotland. Chosen on the strength of his progeny he is sired by the successful Canadian bull GH Simba ET 21E the top selling bull in Canada at $95,000 in 1995 as National Champion. Simba sired: Canada’s 1997 top selling and National Champion bull, the 1998 Denver Stock Show Junior Champion calf. 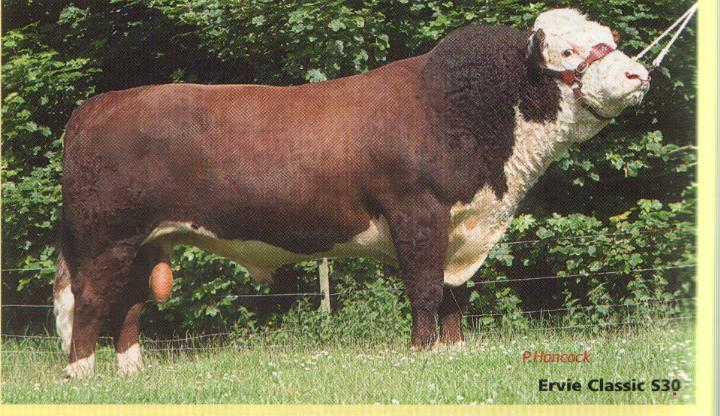 Simba’s dam GH Supergirl ET 15Z produced 5 bulls sold to average $50,000 including Simba. Subsequently she bred GH Buck ET 26H, sold for a record $235,000. Classic’s dam Hockenhull Betty 3rd is a daughter of Woodview Betty possibly the most successful cow in the U.K. show-ring in recent times. A legend in her own lifetime she was sired by Gageboro Suave and bred by R.F.D. Abbott Woodview Hse, Killeshandra, Co. Cavan, sold to W. McIndoe of Scotland at Carrick-on-Shannon. On Mr McIndoe’s departure for Australia she was sold to Sue and Dennis Heath with whom she had an unrivalled show career including the Junior Championship at the Royal Show and breeding several excellent progeny. Calves born in Australia resulting from embryos taken by Billy McIndoe were a better than even match for the Aussies providing several successes there.